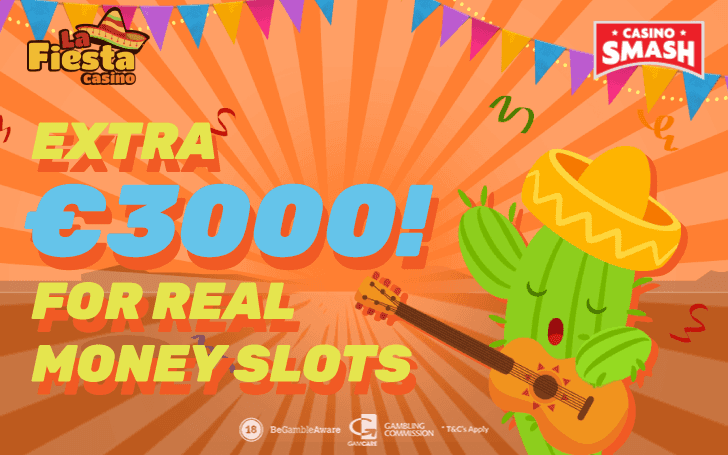 Join the Slots party at La Fiesta Casino and collect up to €3,000 in bonus cash! The beginning of the week can be a bit slow. You may feel like scrolling cat videos or I hate Monday memes online. Or not doing anything at all. So, a party is probably as far from the things you want to do as possible. But is it so if the party comes in a form of free cash and cool Slot games? La Fiesta Casino is a site hosting a never-ending Casino games party. And you’ve been invited to join. Heck, not just to join but also to claim up to €3,000 while you’re at it. Doesn’t sound too bad, does it? The best thing about La Fiesta Casino is not the bonus, though. It’s their collection of games. Hundreds upon hundreds of Slot machines. Be it retro Slots with three reels that you like or Video Slots with video clips and tons of special effects. And it doesn’t end with Slots. You can play card and table games, special bonus games, and Live Casino. And as long as you have an account at La Fiesta Casino, you can play most of it (everything but live dealer games) for free. But the real party begins when you claim the welcome bonus. 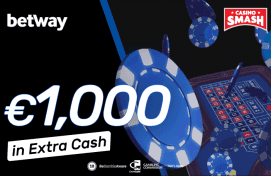 Not only you can play games with free cash, but you can also win real cash in the process! 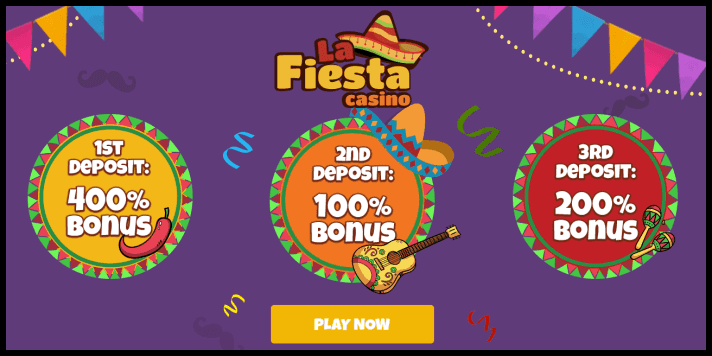 Make your first deposit at La Fiesta Casino and get 400 percent match bonus up to €1,000. You top up your account for the first time and get an extra amount equal to 400 percent of your deposit for free. For instance, you make the minimum deposit of €20, you get free €80 -> in total you have €100 for playing. If you deposit €200, you’ll have a €1,000. You also get a 100 percent match bonus up to €1,000 on your second deposit. And 200 percent up to €1,000 on third. Free €3,000 in total and hundreds of games to play. How is that not a fiesta? With an offer like that, Siesta can wait.